In part 2 of this blog series, i will be talking about one thing which is configuring WDS DHCP options. 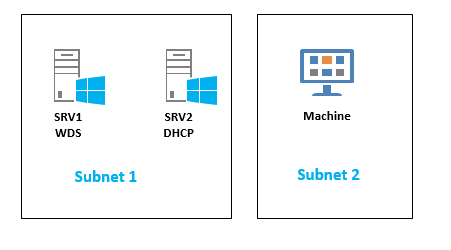 So imagine you have a WDS installed on SRV1 and DHCP installed on the same subnet on SRV2 and you want to allow clients in different subnets that uses the DHCP on SRV2, to be able to get WDS images. To do this, two DHCP options should be configured on SRV2. Option067: bootfile name, in my case im using X64 version of the boot file as nowadays most machines and O.S are X64. You can use boot\X86\wdsnbp.com if you want the X86 version of boot file. This configuration works fine for me.